HALLOWEEN! Oh, Halloween. My favorite holiday. -sad sigh- Here in Australia, they don’t do much in the way of Halloween celebrations, and I feel very lucky that my friend Jackie lives in one of the few neighborhoods in Adelaide that scares the crap out of the trick-or-treaters and feeds them enough candy to fulfill their energy requirements until Easter. 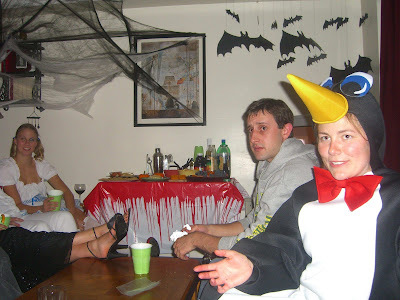 It didn’t really make sense to have a Halloween party this year. I have four friends in Adelaide. One moved back to Chicago. One moved back to Peru. The other is in Melbourne. The other is Jackie. Even if they were all here I don’t think a party for five people would justify the weeks of decorating, menu planning, and cooking that have gone into my Halloween spook fests of years past. So, I thought I would celebrate Halloween vicariously – through myself! 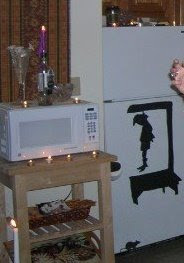 – by sharing the menu and decorations from my 2007 fright night party with you. Hopefully it will give you some terrrrrrrrrifying ideas. I start decorating for a Halloween party weeks in advance. The arts and crafts are half the fun! 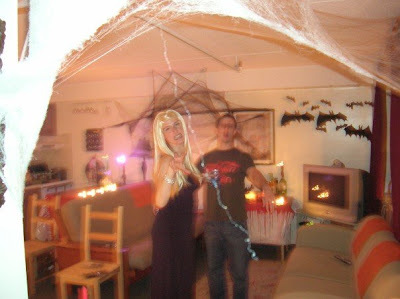 Fake spider webs, plastic spiders on tables, and lots of candles are definitely necessary. But stretch it further and be creative. Martha Stewart is THE authority in my opinion on Halloween decorations and food ideas, so check out her website for some ideas. Last year I downloaded templates of mice silhouettes from her site that I traced onto black poster board, cut out, and taped along the baseboard of my apartment. You can find the silhouettes here. One even made it into the kitchen and was about to raid my fridge! I also looked for other types of silhouettes online and found a scary photo of a hangman and drew it onto a large sheet of black posterboard. I rented some old black and white horror movies and played them on the TV (without the sound) throughout the night. The bathroom is the most fun to decorate! I hid speakers on a shelf and played creepy sounds. I duct taped the light switch in the “off” position and lit the room with only one candle. I sprayed fake blood in the bathtub and placed a “bloody” knife on the floor. I scrawled “Help Me” on the mirror with red lipstick. And I didn’t take a photo – I musta been too scared! The Witches’ Fingers are cheddar crackers shaped liked fingers, with almond slivers dipped in red food coloring for the fingernails. There’s a recipe for them here (not the recipe I used so don’t put a spell on me if it’s bad). The Yummy Mummy is basically a ton of soft cheeses mixed together, shaped like a mummy, wrapped in strips of phyllo, and baked. The Food Network has a recipe here but again, I only took inspiration from this recipe but modified it to my liking so don’t be mad at me if RR lets you down! To make a Spider’s Nest, wrap a round of brie with puff pastry and draw a spider web on the top with a sharp paring knife before baking, then place plastic spiders on top of and around the nest before serving. My Evil Dead platter consisted of ONLY black and orange foods – orange slices, orange pepper strips, baby carrots, slices of orange cheddar cheese, Doritos, black concord grapes and black licorice. The star of the main course was a pair of impaled roast chickens. Again, I took the idea from Emeril and modified it – his recipe is here. I coiled sausages around the base of the impaled chickens to resemble entrails and separately roasted beets and fortified their juices with red wine to make a sauce for the Mashed Boo-tatoes. The effect is all in the delivery – I screamed and stabbed the chicken repeatedly as I brought it to the table. On the side was squid-ink pasta in an orange-bell pepper sauce (again, black and orange). And finally I made Shrunken Heads by coring apples, stuffing them with dried fruits, oatmeal, graham crackers, OJ and spices, and carving faces into the skin, then baking them until the faces shriveled and withered and looked plain ole SPOOKY. And my friend Betsy (aka Dorothy from Oz) brought Creepy (sugar) Cookies that we decorated with fun icings and sugar shapes. Drinks on offer were red wine, and black and orange juices used for cocktail mixers (we had black currant, black cherry, orange and apricot juices). Sparkling apple juice was used to lighten the drinks. My brother-in-law has alerted me to some extremely creepy recipes that would fit well into this menu and that I plan to make in future years. Blood clot and brain cupcakes are awesomely nasty. And the Rice Krispies sushi found here looks like it's wrapped in a human tongue. Please read this form carefully and be aware that by attending the Sánchez/ Potter Spook Fest 2007, you will be waiving your rights and/or the rights of your date/ companion to all claims for injuries you or your date/companion might sustain arising out of the evening and you will be required to indemnify, hold harmless and defend the Sánchez/ Potter residence for any claims arising out of participation in said Spook Fest. … and went on for a full page before asking guests to sign in blood and produce upon arrival at the Spook Fest. Everyone loves a gift, so I provided mini bottles of liquor in mini pumpkin baskets for guests to take home. When guests arrived, I immediately pinned a note card on each of their backs with the name of a super creepy person (real or fake). Guests then had to ask each other questions in order to find out who was on their card. These can be easy (Frankenstein, Dracula, etc.) or more difficult, or even themed (authors of scary books, directors of scary movies, etc.). We also played Witch-ionary and told scary tales. 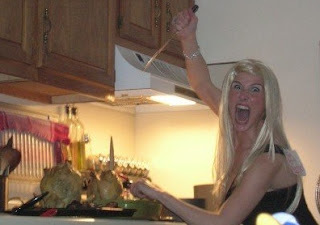 That photo of you stabbing the chickens is what I imagine Phil sees when he wakes up next to a hungover Cari.